It’s that time of year again! Rock the Vote is taking over the interwebs to deliver what they deem to be a very important message to America’s youth: Lil John, Lena Dunham, Whoopi Goldberg, and the Kardashians — all brilliant scholars in their own right — want young people to vote. These celebs have taken on the ever-so-noble cause of “driving the youth vote to the polls.” Apparently, herding young people to voting booths is far more important than educating them on the issues affecting our nation. In reality, the group consistently sways naive, politically uninterested young people to vote for liberal causes. Using celebrities and catchy little videos, the organization attempts to herd these millenials to the polls by telling them it’s cool to vote. Inevitably, “nonpartisan” Rock the Vote brainwashes young people with leftist ideals by having celebrities recite the proper political message in front of hip-hop music. The group’s most recent video features rapper Lil John. 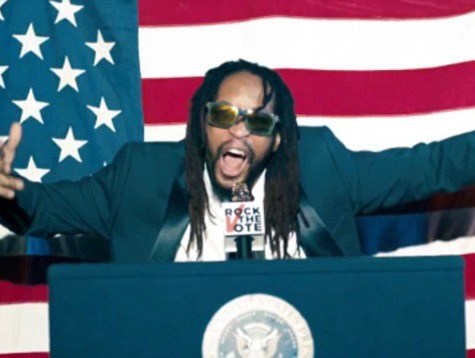 “Rock the vote, rock the vote,” Lil John screams. “Turn out for what?” A myriad of famous actors and musicians proceed to tell the camera why they’re voting. Apparently Lil John couldn’t find something that rhymed with “national bankruptcy.” Or, more likely, he is just as ignorant as the kids he is rapping to. We have yet to hear Miley Cyrus sing about how the U.S. is nearly $18 trillion in debt, how entitlement spending is off the rails, or that our entire financial system routinely teeters on the brink of collapse. Having knowledge about critical issues affecting the nation is not a requirement for representing Rock the Vote and similar groups. In 2004 Paris Hilton was employed as a spokesperson for the “Vote or Die” campaign, and she wasn’t even registered to vote at the time. Don’t get me wrong, it’s probably a good thing that she wasn’t registered and didn’t cast a ballot. And that’s the point: the country would likely be a lot better off if clueless voters, both young and old, stayed home on election day and kept stalking their ex-lovers on Facebook. But Rock the Vote and similar activist groups would lead you to believe that it’s a mortal sin to not cast a ballot. These crafty liberal activists manipulate a clueless population; it takes a Miley Cyrus video to get these millenials off the couch and to the polls (that fact alone should terrify all of us). Democrats have realized that they are not the party of winning ideas (witness Detroit, where bloated welfare programs have created generations of unskilled families dependent on government largess) — so instead they’ve become the party of pretending to be hip. This has worked well for the left in the past. In the 2012 presidential election, President Obama received almost 70 percent of the youth vote. Social media, countless celebrity endorsements, and hip campaigns like those crafted by Rock the Vote played a significant role in helping Obama secure those votes. Millenial voters should be equipped with knowledge about important issues that affect the nation, and those issues should be presented in an intelligent and balanced way. Republicans are more frequently champions of winning ideas — ideas that actually work, and can offer a brighter future for the United States. But when the message is delivered by a boring white guy in a suit, like Mitch McConnell, it’s not easy to get young people motivated. The GOP desperately needs to recruit conservatives who can communicate effectively to youth. If this means reaching out to celebrities, there’s no shortage. People like Stacy Dash, Vince Vaughn, and Kathy Ireland have all demonstrated an ability to throw their weight convincingly behind conservative policies. Topics like fiscal responsibility and national security might not be as fun to advocate for — or as easy to understand — as drug legalization or marriage equality. But these matters are critical for voters to understand and act on. The Republicans must use all methods possible to energize young voters on these pressing issues. The future of the nation may very well depend on it. Follow Kristin on Twitter @KristinBTate.